Welcome to www.artofwar.org.uk a collection of paintings and artwork depicting battle scenes throughout history by myself, Paul Bishop. 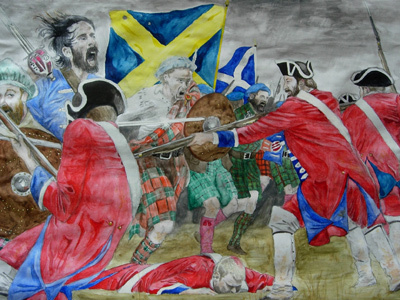 In my artwork I try to capture the horrific trials of human conflict when enemies meet in battle, battles such as Crecy, Towton, Afghanistan, Burma, Barnet, Flodden, Culloden, Inkerman and the Somme. Born in 1959, I grew up listening to stories told by people who had experienced two world wars. My Grandfather who saw the horrors of 'Ypres'in the Great War or my Father's experience of the early days of the blitz in Sheffield, when as a Fifteen year old, watched what he and the neighbours thought were parachutists coming down from the sky, only to find out too late that they were landmines being dropped. The concussion from the blasts blew him off his feet where he lay for several minutes gasping for breath. Stories like these unsurprisingly fuelled my interest in history and warfare, however my interest in the art of warfare started from an early age with the Ladybird History books and their illustrations by John Kenney which was for me the inspirational catalyst. There have been numerous influential artists, recent artists like Angus McBride and Graham Turner or the past masters such as velazquez and his painting 'The surrender of Breda' painted in 1634 showing a compasionate side to warfare. Another painting which I always remember is the haunting picture 'Gassed' painted in 1918 by John Singer Sargent, showing the horrors of the Great war. Other influential artists were Robert Gibb and Lady Butler, depicting the British Empire Wars, and one of my favourite pictures, the last stand of the 44th. by W.B.Wollen. In my artwork I believe that accuracy is imperative and try to research every detail possible, the correct clothing, armour and weapons which all, hopefully, contribute to a convincing and enjoyable piece. Please feel free to browse the site; it should appeal to anyone with an interest in militaria.